If you’re looking for the ultimate in what wristwatches have to offer, you may want to take a serious look at Jaeger-LeCoultre watches. They’re not for everyone, as they’re fairly expensive, but the Swiss company has been in business for nearly 200 years and has created numerous timepieces that changed the world of watches. The company’s watches are available in models for men and women, are offered with a variety of complications, many choices of case material, and include a surprisingly wide range of prices. They’re among the most respected and admired timepieces on the market today, and if you’re looking for a watch that will really turn heads, they are a great choice. Read on for the full Jaeger-LeCoultre watches review. The build quality is exceptional. They use a variety of metals in their cases – stainless steel, pink gold, white gold, platinum, and titanium. The watch face is protected by rock-hard, scratch-resistant sapphire crystal. Most models are rated to at least 50 meters of water resistance. Straps are leather and bracelets are either steel or gold. When you buy one of these fine timepieces, you’re buying into nearly 200 years of innovation, and that innovation comes from the movements, which are made in-house. While there are a few women’s models that feature their own quartz electronic movements, all of the others, including all of the men’s models, feature either automatic (self-winding) or manually winding mechanical movements. Over the years, the company has designed and built more than 1200 watch movements, often targeting either elaborate complications or trying to achieve some market “best,” such as creating a watch that’s ultra-light, ultra-thin, or ultra-small. These watches feature a long history of innovation, and the company has produced many “firsts” in the industry, creating the thinnest watch, or the first watch with a sapphire crystal, or one of their many “grande complications” – watches with multiple mechanical complications, such as a chronograph with a minute repeater or a tourbillon watch with a perpetual calendar. Their “Reverso” model has a watch case that swivels on the bracelet, allowing the wearer to wear the watch with the face facing the wrist, for occasions when the wearer is engaged in some activity that might endanger the watch. To this day you’ll find a variety of complications, or you can still buy one that simply tells the time. 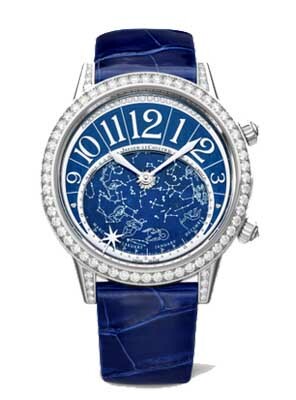 There’s quite a variety of styles, shapes and features with Jaeger-LeCoultre watches. They offer some 200 or so models, with watches for men and women, and they offer them with quartz (women’s models only) or mechanical or automatic movements. When shopping, you’ll have a choice of case material, including several varieties of gold, along with steel, titanium, and platinum. You can buy models where the bezels are embedded with diamonds, if you’re a fan of bling. You don’t necessarily have to choose just one of those complications, either, as many models include more than one. 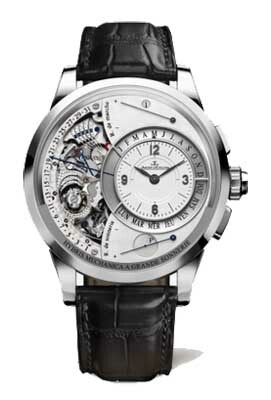 Their Master Grande Tradition Grande Complication, for example, includes a tourbillon, a zodiac calendar, 24 hour civil time, an hour-minute-month repeater and something called Voûte céleste, or “celestial vault”. As with many luxury watch brands, you’ll find more models for men than you will for women here. Not only that, but the models for men are far more likely to include complications than the women’s models, which tend to be designed and sold more as jewelry items than as cutting-edge horological pieces. As these watches are elaborate, high-quality mechanical timepieces, you will have to send them back to the company every 3-5 years for service. This service will include disassembly, checking for worn or damaged parts, replacing parts if necessary, and cleaning both the movement and the exterior of the watch. While this can be an expensive process, it’s necessary to ensure that your Jaeger-LeCoultre watches continue to run as well as it was designed to run. You will want to store your watch in a cool, dry place and keep them away from extremes of temperature and strong magnetic fields. With proper care, you’ll find that your watch will run well for decades to come. Despite their high prices, you’ll get a warranty that is average in the industry. You’ll receive a warranty for two years from the date of purchase against defects in materials and craftsmanship. About 90% of all watch companies offer a warranty of similar duration, though the company tests everyone of their watches in-house for 1000 hours before shipping it. This ensures that defects are exceedingly rare. Prices range from moderately expensive to outrageously so, putting them at the higher range of pricing as luxury timepieces go. At the low end of the spectrum, there are a few women’s models with quartz movements that are priced starting at about $4000. At the high end of the spectrum are ultra-limited edition models with multiple complications and precious metals, and these can easily run upwards of $250,000. Yes, these watches are very expensive. They’re also very good watches with an exceptional reputation. 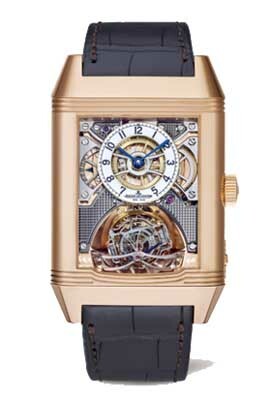 As with most luxury watch brands, these watches have their prices set and carefully controlled by the manufacturer. This is accomplished by limiting retailers to a few that are authorized by the manufacturer to sell them at prices set by the company. This is done in order to avoid “diluting the brand” through excessive discounting. You can purchase at the official Website, or at one of a handful of authorized retailers around the globe, most of which are located only in major cities. You can also buy them through a few retailers online, and these will provide your best opportunity to buy discount Jaeger-LeCoultre watches. These sellers are largely “gray market” sellers who sell authentic Jaeger-LeCoultre watches but will offer them with their own warranty. If you’re looking for beautiful work, precious metals, elaborate complications and a long history of making innovative timepieces, you owe it to yourself to have a look at these amazing watches. They offer lots of style choices, lots of features, a choice of many movements, and a surprisingly diverse (though on the expensive side) range of prices. Many models are ultra-limited in production, and if you own Jaeger-LeCoultre watches you’re usually going to be the only person at the party wearing one.